SOUTH BEND, Ind.— The top-seeded Notre Dame Fighting Irish (32-3) ended the season of the ninth-seeded Michigan State Spartans (21-12) in blowout fashion on Monday night. 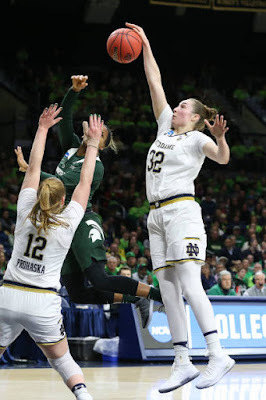 After a second quarter offensive explosion, Notre Dame handled Michigan State with ease in a 91-63 victory to earn a trip to the regional semifinal in Chicago on March 30. Notre Dame used a 19-1 run in the second quarter to blow the game open and never looked back. At the 8:28 mark of the second quarter, Notre Dame held a 28-19 lead over Michigan State until Sidney Cooks splashed a three-pointer for the Spartans at the 2:48 mark, the Irish expanded their lead to 47-20. Throughout the run, Jessica Shepard highlighted the run with a mini 6-0 run of her own. At the halftime break, Notre Dame had three players with scoring figures in double-digits– Shepard (14), Jackie Young (13), and Arike Ogunbowale (13). Ogunbowale surpassed 2,500 career points in the first half of her final game in Purcell Pavilion. Young was on triple-double watch at the halftime, adding eight rebounds and five assists to go along with her 13 points. Brianna Turner contributed with eight points and nine rebounds through the first two quarters. For the Spartans, Cooks paced the way on both sides of the basketball, finishing with her second career double-double with 17 points and a career-high 12 rebounds. Indiana native and Michigan State’s lone senior Jenna Allen also contributed for Michigan State with 12 points and five rebounds in defeat. Young led Notre Dame all-around throughout the contest. The junior finished with 21 points, 11 rebounds and seven assists on the night. Turner surpassed Ruth Riley’s school rebounding record of 1,007 during the second half. With 11 rebounds, Turner finished the game with 1,010 career rebounds and will look to snag more in the coming rounds of the tournament. In the Chicago Regional, Notre Dame will face fourth-seeded Texas A&M on Saturday with the time to be determined. “We played them last year in this round and they’re a great team. Their point guard, [Chennedy] Carter – she’s an amazing player. She was National Rookie of the Year – she’s now a sophomore. I think she had 38 in their game against Marquette the other day,” said Notre Dame coach Muffet McGraw on Texas A&M. “They’ve got a really good team, very different from last year. I think just one player in the starting lineup remaining. They’ve had a great year. I think they have overachieved to get this far. The other half of the Chicago Regional will be set later tonight, as the winners of the No. 3 Iowa State and No. 11 Missouri State contest will battle the winner of No. 2 Stanford and No. 7 Brigham Young.